Part 3 of our Finance Transformation blog series. Read the full series here. A shift is happening in the marketplace. I’m sure you’ve noticed the trend: there are more new technologies available for Accounting and Finance than ever before. Most notably, ERPs—many of which are between ten and fifteen years old—are finally getting an overhaul. The next wave of ERPs is more agile, mobile, and adaptable. Executive leadership is expecting Finance to focus on getting the most from the upgrade as part of the shift toward digital transformation. But to ensure success, there are a few essential steps that come first. Committing to a strategy of simplifying is putting other projects and new software solutions on hold, to avoid perpetuating the old trend. And in most cases, this approach makes sense. 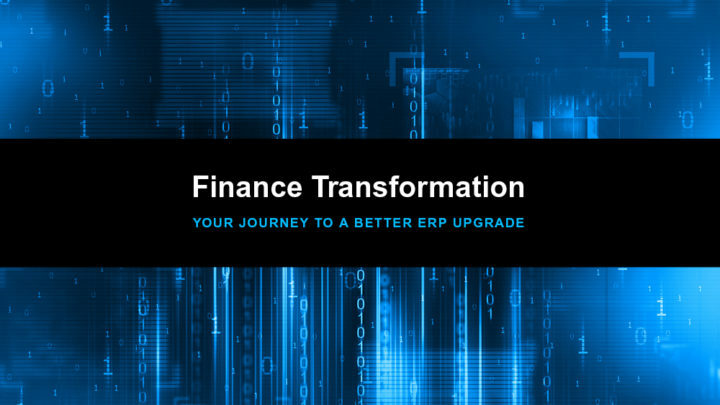 But one of the biggest issues that jeopardize a successful ERP upgrade is the legacy processes that persist, and the fact that they take up so much of accounting and finance’s time. The second largest issue is that, as a result, those resources don’t make it to the table for critical ERP discussions. IT or others who aren’t subject matter experts end up making business process design decisions without accounting’s input, and that hinders the new ERP’s potential impact from the outset. For this reason, it is essential to implement a finance controls and automation platform before you begin the upgrade, to automate the most manual processes—shifting them toward best practices instead. As a result, you free up your teams to invest their time and energy into the upgrade initiative. Selecting the right platform is key. You want one that is complementary to your ERP environment, to ensure that it will enhance your significant ERP investment. A process automation solution provides a central location for your financial data and controls, and maintains an audit trail that simplifies both internal and external reviews. The best solution is ERP-agnostic and complements your ERP environment, filling a ‘whitespace’ in the close-to-report process: and this is exactly what BlackLine is designed to do. This means that, for those organizations running multiple ERPs or multiple instances of an ERP, BlackLine functions just the same. And when accounting and finance teams are tasked with maintaining data and reporting integrity over the course of a changing ERP landscape, having an accounting process automation solution that remains consistent is a huge relief. While the ERP is the system of record for daily transactions, and subsequently may handle consolidation and external reporting, BlackLine captures balances and transactional data across multiple data sources, including the ERP. This centralizes, standardizes, and automates traditionally manual processes like balance sheet substantiation, manual journal entries, and intercompany accounting, to name a few. As you already know—and may currently be experiencing—ERP implementation projects are typically multi-year, multi-phased projects. They require a lot of heavy lifting and a significant financial investment to achieve those big wins. BlackLine is designed to address process gaps that persist even after go-live—an ERP upgrade won’t solve every problem—and can help your organization achieve quick wins, typically in as little time as weeks or months. BlackLine provides a fast, proven way your team can cut your financial close effort by up to 70%, through automation and balancing of the record-to-report workload—and it’s achievable with a fragment of the effort compared to an ERP upgrade. While a simplified IT landscape makes a great deal of sense, a solid, quick win that delivers time savings and an ROI is a no-brainer. Even better, these are wins that Accounting and Finance can continue to capitalize on after the ERP upgrade—just the first step in a broader transformation. And what better way to gain momentum than that? Read this white paper to learn even more ERP upgrade strategies, and discover how to free your accounting team’s time by 50%.